Built-in apps in Windows 10 can be your reliable assistant. Buying a new device on Windows 10, users can use it from the first minute inclusion. For a modern user is very important to know that if you buy a laptop, tablet or desktop computer he will not have to spend a lot of time searching for the right programs and applications. At Microsoft, we very well know about it. What we’ve done before uploading to your computer Windows XP or Windows 7? Right, plied the vast space of the Internet in finding the right player for music and video playback, program for viewing documents format PDF, downloading various widgets with weather, clocks, calendars, etc. Well even if these programs were free, and often they were very expensive and had to download pirated versions with questionable resources. Naturally this led to the fact that along with such programs, inexperienced users often download viruses and Trojans spent a lot of time, nerves and effort. Seeing the suffering of their users, Microsoft is seriously thinking over the solution of this program. And it’s worth noting that they succeeded very well. Soon they began to appear built-in apps from Microsoft. Let at first there were difficulties and misunderstandings on the part of users, who are accustomed to certain programs, but the water wears away the stone. I always dreamed of to finally start work on the new device was simple and convenient. When Microsoft released in 2015 the new Windows 10 , then immediately rushed into the eyes of a native application. Now, installing Windows 10, the user receives so necessary before a set of utilities and applications that work with the device. Yes, this app was already in Windows 8, but they were sometimes not improved and uncomfortable. 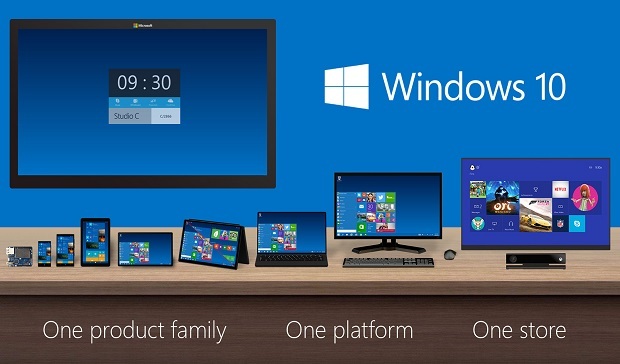 Now Windows 10 the joy of the users can be called a system of “plug & play”. Simple words in your laptop, tablet or desktop PC you already have everything you need to operate correctly. So hear now the cries of some users that why they need these apps. I have a very simple explanation. Dislike the built-in applications are so much stuck in their heads just because some of them did not want to learn or at least try them. Hence the hostility, hence the huge number of articles on how to remove the built in applications Windows 10. But there are those that would tell about the settings and proper use of applications from Microsoft. In this article I will tell you more details about each built-in app and will tell you how to use them effectively. Most regular users and not aware that his device on Windows 10 includes a set of useful built-in apps. And just need to find them and view. This can be done in two ways. The first is to open “start menu” and click on the option “All apps”. You will see a list of all built-in applications and utilities, as well as those that were installed directly by you. Also see this method you can open “Options”. Here you will see a section called “Applications and opportunities”. In this section, too, will all the installed apps. Recently this topic has the opportunity to reset a misbehaving app. Sometimes it happens that for some reason an application or program are working correctly. Simply click on the link “advanced settings” in the dialog box to reset the application. That’ll come in handy for inexperienced users, as you will not have to read sometimes outright stupidity of correcting errors in the built-in applications. Well, let’s talk specifically about each built-in app. How to configure it, how to use and what good is he. Standard built-in application that allows you to configure the alarm for the time you want to be on time for work, business or school. The game is simple: put the time you want and include an alarm clock. A laptop or tablet will definitely Wake up on time. Also here you can watch the time anywhere in the world at the moment. Write the name of the desired city on the map and the system will show the time in a given period and can also compare the difference in time. Very convenient for those who travel a lot. Can also use a standard timer and a stopwatch, if there is a need for this. Previously, in order to get access to photos and files from your smartphone, you need to install certain program, which helped to implement it. Now nothing of the sort to be done. “Manager phones” is sufficient to set the desired parameters. A large part of its functions aimed at helping users of the iPhone, iPad and Android to use Microsoft services. One of the functions of the “Manager phones” is to import photo library from the phone to the computer. And he perfectly copes with it. To do this, simply connect your phone or tablet with a regular microUSB cable. The computer will find the device and you can enjoy watching videos and photos taken on smartphones or tablet without having to install any third party applications. From the name itself it is clear that this application is designed to record audio messages or just record some important things. For example, I often use this app as a kind of “reminder”. Speak I need an audio text with an important message, and then just listen to it. Sometimes even write down interesting ideas for teaching or writing articles and reviews. Handy to have a helper, because sometimes the smart thing useful to record just now on paper and on tape. In Windows 10 there is a tool that enables you to plan your time. It’s called “Calendar”. The application does not have any advantages compared with similar programs and Internet-services, but as a mere planning tool, it can be used. Launch “Calendar” from the start menu. In this case, the tile “Calendar” displays information about the current date, and planned for the near future events. So learn about the next event without opening the app, you can just search in the start menu. Also love the ability to see and forecast the weather, both in Celsius and in Fahrenheit. The app is very convenient and has become one of the main for me. It also works with live tiles, giving me quick access to the records in “Calendar”. I knowingly wrote about the apps “Calendar” and “Mail” each other. They really are very closely related: from the “Calendar” easy to enter “Mail” and Vice versa. Now a little bit about the Mail app. For about 10 years my main mail service is Outlook.com. Very convenient and easy to use. The appearance of a built-in app “Mail” I was very pleased with. Convenient, easy to settings, easy to use. What else you need for modern man for communication, work, business and personal correspondence. Moreover, to this app you can connect any other account, except outlook.com. It is easy will be able to use your account from Google, Yahho or other postal services. To do this, simply click on the option “Add account”. For a few moments and all your emails will be in one place and not scattered everywhere. Worth adding that the last time the Mail app and the Calendar pretty much changed in terms of design, as it began to get new elements of the new system of planning and design Fluent Design. Very nice and stylish. Modern device it is impossible to imagine without a built-in calculator. Windows 10 is also not lagging behind from this trend. It would seem than can surprise them with this app. But the developers from Microsoft it was even possible . 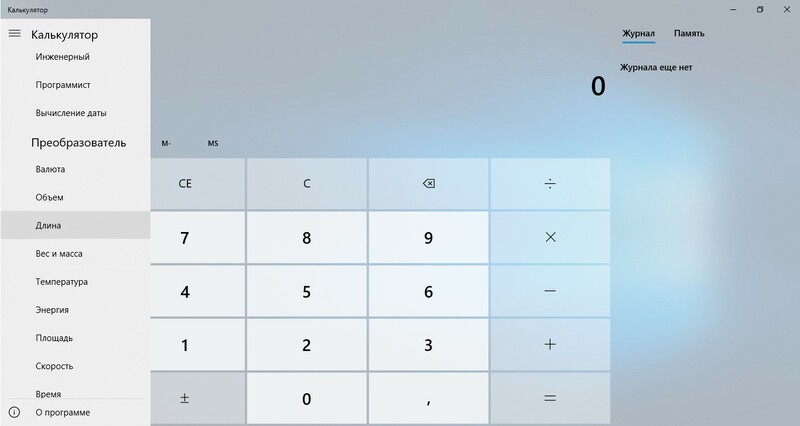 Users of devices on Windows 10 has got a feature rich calculator. He has 4 variations: normal, engineering, programmer and date calculation. I am sure that most users of this innovation like. But, apparently, developers, and it wasn’t enough. After patch Windows 10 Update Fall Creators in the “Calculator” is now a function of the transducer. Now you can translate dollars into hryvnia and Vice versa, to convert one unit of measurement to another. Before us is really a modern multifunctional calculator, which lacked many, especially pupils and students. Modern laptops are equipped with web cameras, not that, of course, quality in smartphones, but still. Microsoft has created a special application which is called “Camera”. For 2 years, since the advent of this app, though slowly, but usovershenstvuetsya. There is now an opportunity to set your laptop to do continuous shooting and set the timer for photographing. Honestly, if you compare with the capabilities of the cameras and their settings to smartphone, then this app much worse. But for snapshots and video recording may be useful. All photos and videos are automatically saved in your computer. Another very useful built-in application in Windows 10. It appeared with the release of the new Windows 10. The application uses the map of the known companies HERE. They are very comfortable and clear. If you download offline maps, you can use them without Internet connection. It is worth noting that they are still a little behind in its capabilities from Google Maps. But with each new release usovershenstvuetsya, there are opportunities. You can plan your route, make notes directly on the map, to see the situation on the roads. Interesting for many will be a function of viewing 3D maps of cities. Unfortunately, a large list of cities has not entered any city of Ukraine. I didn’t even notice how slowly they moved. Especially because I use voice assistant Cortana, which shows me the route, notifies you of traffic jams. Who among us has not experienced at least once in life with the problem of playing a movie or video. Before you had to download a foreign player, to find and install certain codecs to watch movies or series in a specific format. It took time, made me nervous, if suddenly your home video or downloaded movie was impossible to reproduce. In Windows 10, everything changed. Microsoft released a built-in application “Cinema and TV” that can play any formats videos. You don’t need to think about whether it is possible to watch your favorite movie or TV series. Just start the movie and it will automatically open in the app “Cinema and TV”. It is worth noting that the developers are constantly updating applications, adding new codecs and features. With the latest update to Windows 10 Fall Creators Update the app received the support of mixed reality. Simply put, now the owners Suite, which support Windows Mixed Reality will be able to view the video. Really almost science fiction. Most need and my favorite embedded application. Now no need to search contacts, friends, view the correspondence in the mail. All you have in the right corner. These little two man at the bottom is what posh People app. If when you turn on your laptop you will not see the bottom of this application, you can be 2 reasons: you need to upgrade to Windows 10 to version 1709 or include this application. To do this, go through the path start-Settings – Personalize-taskbar. Opening this section, scroll down and you will see the settings for the People app. READ How to collect the world's largest mirror telescope? The main purpose of the new function — “to put people at the heart of Windows.” You can use the drag action (drag and drop) to place contacts in the right pane of the task pane. Thus, you get fast and comfortable access to the people with whom you communicate. These contacts will appear when you use the Share feature to share files in Windows, and messages from them will be shown in priority order in applications Mail, Skype and Xbox Live. Your favorite contacts will be able to send so-called “Pat on the back” — animated smileys that will be displayed next to the task bar. You can pin to the taskbar, up to three contacts of friends or colleagues with whom you communicate most often. Everything will come to you from the laptop. Of course it is worth noting that while you can only associate contacts with your Microsoft account, Skype or Mail to Windows 10. I am sure that in near future there will be support and other services such as Messenger, Viber, Telegram and others. Windows 10 has a new music app under the name “Groove Music”. If you have recently used any music software, Groove will be self-explanatory, but still worth investigating some of its notable features. Groove allows you to browse music collection by album, artist and track. You can also click on the search icon and search anything in the collection in just a few seconds. While the track is playing at the bottom will appear the controls. There is album art, track, artist and controls due to the music player. To use this app very easily. Now you do not need to install a special player. Just choose your desired ringtone, turn it on and listen. Of course the app does not supports all formats, but audiophiles are unlikely to listen to music from laptop or tablet. Inexperienced listeners app like very much. With the help of app Groove Music provided by the usual streaming of music via the Internet. You can also manage locally stored music. In “Music Groove” also has a free streaming listen to music from OneDrive. So if you just want to listen to your music collection from the cloud with no monthly fee, just upload it to OneDrive, and then indexed by “Music Groove”. The name itself already suggests that this application is about the weather. Before downloaded special widgets, go to the websites about the weather. Now it’s all gone. Open the app, the system automatically determines your location by yourself or enter the desired city. A couple of seconds and the current weather, know everything. Can see the forecast for today or several days in advance. You can also see a map of the movement of atmospheric fronts and temperature regimes with explanations. You can find and compare the weather over the last year. Quite simple and intuitive application, which is sufficient for normal use. It is also worth noting that the app is universal, which means the possibility of its use in personal computers, tablets and phones. For me it is very convenient. And the weather forecast is always very accurate, unlike some other weather services. The settings app is clear and very simple. As the name implies, this app is designed for viewing photos local your computer or from OneDrive, which is very convenient for the user. A big plus for the application is the ability to edit photos, which is convenient for those who do not really want to upload third party applications for this. Right from the app you can send photos to each email, though not in the social network that for many will be a nuisance. Also, this app will be a great tool for viewing images by default, when downloading photos from the Internet. It is, of course, you can if you want to change. Significant changes have occurred in this application after the release of Windows 10 Update Fall Creators. The updated Photos app now you can add to your photo and video filters, text, 3D effects (and soon 3D objects) and even to sign them manually using a digital pen, so you can create amazing stories with music, common theme and transitions. To begin, click on “Creations” and two (or more) photos or videos, and the Photos app will automatically create your video memories. Save it to enjoy it and share it, modify it in one click or self-edit to achieve the desired result. To start creating your own story, go to “Photos” is a free app in Windows 10. If you don’t know, Mixed Reality is a combination of augmented reality and traditional virtual reality. First, the technology superimposes an interactive virtual objects into the real world, while the latter puts the user into this newly created space. To obtain a full Mixed Reality experience, you need a headset that is different from traditional VR headsets. Headset Mixed Reality different from the VR headsets so that they are equipped with a pair of cameras on the front to capture the actual reality and bring it into the virtual world. In Mixed Reality Viewer, you can overlay 3D objects as taken from the community Remix3D and your own created in Paint a 3D image in the camera of your PC. This will help you even more fun to create and tell their own stories. Begin to create in Paint 3D and select the option Mixed Reality (mixed reality) to see your creation in the real world, or go directly to the application Mixed Reality Viewer, which is available for free in the Windows 10 Update Fall Creators. Microsoft really really took a mixed reality. Not for nothing was presented to Microsoft Hololens, the headset is designed and produced by partners that support Windows Mixed Reality . I will tell you, as someone who has already managed to try out the mixed reality Portal, but only with the help of simulation, it’s just fantastic. When you’re in, you forget about everything. Open the Microsoft Edge, can communicate in Skype, just walk across the meadow and through the mountains, listening to the birds singing. Believe me, you feel fantastic. I was a little described this process in his article. Not everyone will be able to use this app. This requires that your device support the required configuration settings. You can check your device for compatibility. The system itself it for you. Then you need to do everything as I described in my article. Before you really open a portal to another world technologies. You might then think about buying a headset that’s compatible with Windows Mixed Reality . In Windows 10 you will find new free built-in application Paint 3D, which will help you to unleash your creativity — to experiment, create and share graphics in a new dimension. Create your own three-dimensional masterpieces or two-dimensional objects with the stroke of a pen. In Paint, 3D you also get access to the community Remix 3D where you can download three-dimensional models and change their design in 3D Paint. The app, of course, requires some skill of working with him. Unlike his older brother, the famous application of the Paint that was used by each of us, you need to be retrained. From my experience I would say that I had to sweat a little, studying all of its features. But now this app has been indispensable for me. Open and try it you can just search the list of programs or by right-clicking your mouse on any photo or screenshot, select Open with “Paint 3D”. You are immediately sent to the Annex, where you can adjust the photo to add a bit of creative creativity. Sway is a new Microsoft Office program with which you can easily create interactive reports, personal stories, presentations, etc. and share them. I often use it for presentations. First, add your own text and images, browse content from other sources and import it, and then see how the Sway will perform the rest. Sway in your imagination limit ready-made templates from which it is difficult to make a truly unique presentation. To transform and showcase the content in a modern interactive style, attract attention, no longer need to have design skills. In Sway you will not spend a lot of time on formatting. The whole work takes the built-in designer, thanks to which your work will look better. If the initial design does not quite match your taste or mood, it’s easy to apply a different or completely redo it to your own imagination. To share finished presentations Sway is very simple. Family, friends, classmates and colleagues can view your artworks on the Internet without registration, login or downloading of any materials. To increase control over the content to which you grant access, you can at any time change the privacy settings of any presentation Sway. Recently application Skype was integrated in Windows 10. Who from us though time in life did not use Skype, not wrote in this message, not led the business negotiations, had no contact with friends and relatives, regardless of where they now live. About the Skype write a lot: some praise, others criticize, but everything to enjoy. In fact, in my opinion, an alternative to Skype as the means for video calls, yet. Let had a lot of competition, if users don’t like its new design and capabilities, but it still is popular. The developers of the company Microsoft, apparently, realizing that their signature video call service is experiencing not the best times, presented a major update to the mobile client for Skype. When designing the updates, the creators have paid special attention to the possibilities of exchange of messages between users, borrowing some ideas from competitors. Now you do not need to separately download and install it on your device. Simply enter your details and start using it. The good news for many is the fact that the service is synchronous voice speech translation — Skype Translator preview now supports ten languages. In addition to Russian, English, Spanish, Chinese (Mandarin), Italian, French, Brazilian Portuguese, German and Arabic, the service “understand” Japanese. In other words now you can chat with a foreigner. He will perfectly understand you, and you have it without any outside help. At Microsoft trying to Windows 10 users as you feel more comfortable using the new operating system. The set of built-in application allows the user not to think about where to find the right program or app to view your photos, listen to music, watch your favorite TV series. Everything is already there in a new laptop. It is very good for the average user. I’m generally a supporter of the system “plug & play” so tired of third-party programs and utilities. Albeit sometimes with built-in applications and you encounter problems, but who doesn’t. The important thing is that they already have and will benefit the user regardless of what device on Windows 10 it works. Whom to work, if robots take over the world? You are reading an article on the Ecosystem Microsoft built-in apps. All materials on the site Gadgets F, а также и статья Ecosystem Microsoft built-in apps - written for the purpose of information enrichment and we are happy if you like our magazine.